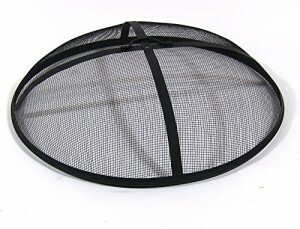 When it comes to enjoying your outdoor fire pit, safety must always come first and therein comes this must have accessory called the fire pit screen. 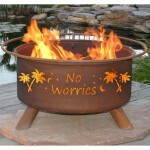 Fire pit Screens are most especially important for wood burning fire pits. 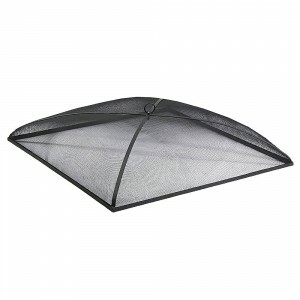 Its common knowledge that fires can start and spread from the smallest of embers not to mention they could cause burns on one’s person and others so to keep this under control, a fire pit screen is needed. Screens are typically made of heat-resistant metal such as stainless steel, powder coated steel, carbon steel or cast iron. 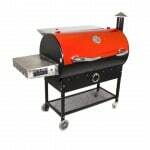 Steel is more popular because it’s very heat resistant, light in weight and durable. 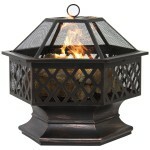 Some fire pits come with their own custom screens but in case your chosen one doesn’t, finding one shouldn’t be a problem because there are screens of just about any diameter and size in the market today and are available in any shape from round dome, square and rectangle box style. Basically you can find any shape in the market or have it made. Most local laws on fire pits most especially in regards to wood burning fire pits insist on screens as a requirement but that aside using a screen is the responsible thing to do. 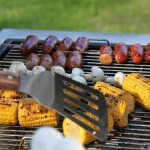 So why use a fire pit screen? It’s used to protect embers and sparks from floating out of the fire pit. 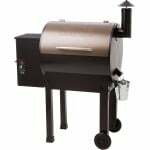 When the pit is not burning it will serve as a cover to keep it clean and protect against materials that have no business being in the fire pit from getting into the fire pit such as leaves and papers. A screen will however not do much against elements such as water therefore the need for a proper fire pit cover when the pit is not in use. 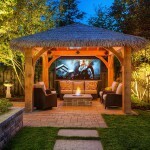 Other than the above obvious reasons why screens are important, another reason why you should use a screen is because of their mesh-like feature which helps to regulate the air flow in a fire pit. This way even with strong breezes, the air circulation in your fire pit will not be affected therefore your fire wood burns longer and consistently saving you on fire wood. 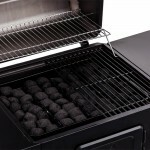 It well help to keep the ashes contained and from being blown out of the pit. With a fire pit screen you can enjoy your fire pit experience without having to worry about the dangers of starting fires, destroying property and causing injury. 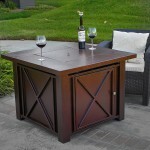 Whether you’re building your own wood burning outdoor fire pit of buying one, a screen should be added to your budget. If you decide to purchase one, find out if it comes with a screen. If it does not you will find plenty of manufactured screens that will fit your fire pit just right or better yet, you could have one custom made for you. 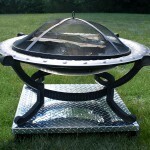 A hinged fire pit screen has two doors connected to its frame by hinges. To use the fire pit, you just lift the doors up. Are made of two halves joined at the top. The smaller of the two halves goes into the large half using an axle at the top thereby giving you access to the pit. Screens that incorporate this style are mostly round. 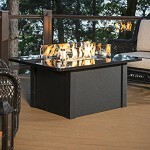 Just like the name suggests, you lift the screen up and off the fire pit to access your fire pit. 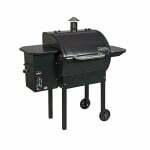 It’s suited for small fire pits and bowls. They come with a handle too for easy picking. Finding the right screen can be quite a problem especially when you do not know how to go about it. Before buying a screen of any shape, deciding how you want the screen set on the fire pit will determine the size of screen needed. 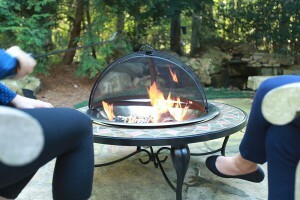 A fire screen can either overlap the diameter of the fire pit burner by a few inches or it can completely cover or enclose the whole fire pit, thereby in the latter the fire pit sits inside the screen. 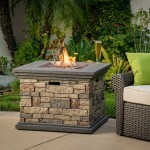 Buying one that completely encloses the fire pit may not be a problem like buying one that sits inside the fire bowls or overlaps the diameter of a circular pit or the sides of a rectangular and square fire pit. The good thing is that the market quickly adapts to satisfy customer needs so screens for this kinds of fire pits is no different. Screens are therefore in plenty, however getting the right size may be a little problematic. 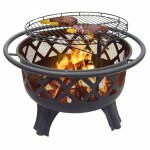 Measure inside fire pit diameter and add 4 inches. For Example: if the Inside of the Fire Pit diameter is 45 inches, add 4 inches to your measurement which then becomes 49 inches. You will use 49 inches when purchasing your screen. 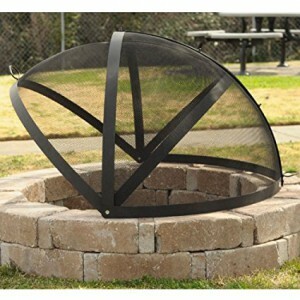 So how about a rectangular or square fire pit screen? 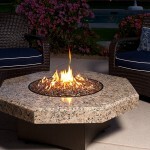 Because of modern technology, fire pits now come in a variety of shapes and sizes not the traditional common round shape. 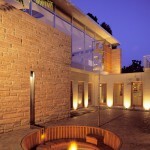 Rectangular and square shapes for fire pits are also becoming popular bringing with them the problem of finding screens to best suit these shapes. Basically all u need to do is measure the length and width of the inside (burner) of your fire pit and then add a few inches on top. 2 inches on each of your width and length measurements will do just fine for both rectangular and square shaped screens. Do the same for the length for example you get 46 inches then your dimensions become 48 inches. So 35 inches for the width and 48 inches for the length will allow the screen to fit over the fire pit with two inches to spare on each edge.